MyMemories Blog: Meet this week's *Featured Designer* - It's Amanda from "A-Manda Creation"
Meet this week's *Featured Designer* - It's Amanda from "A-Manda Creation"
Happy Monday everyone!! This week we would like to showcase another AMAZING Designer at MyMemories.com! It's the A-Mazing *A-Manda Creation*!! Amanda is a wonderful Designer and a super sweet person! She has a ton of great things in her shop to choose from and EVERYTHING is on *SALE* this week! My name is Amanda, I am wife to Dave for 10 magical years, and mom to Zach (6) and Josh (2.5). I started designing digital scrapbook kits in January of 2011 and it has been the most creatively rewarding "job" I have ever had! Besides designing digital scrap kits I also teach private piano and voice lessons in my home. I have always been creative and have dabbled in all sorts of crafts from cross stitching to quilt making. I finally feel like I have found my favorite, scrapbooking, make that DIGITAL scrapbooking, ever since my boys were born. I love doing special things with their photos. I love finding new and fun ways to use my digital supplies in a more "traditional" way too. Creating amazing printables to theme their birthday parties, making backgrounds for them to stamp their handprints on and more. Keep an eye in the shop for more of those fun things to come! So, be sure to get on over to the *A-Manda Creation* shop at MyMemories and check it out! You can also find some awesomeness on her blog and Facebook page so be sure to check those out too! TWO $100 shopping sprees to her shop at MyMemories.com! So be sure to post and tell her what YOU love best to enter to win! Of course we have THREE Lucky Ducks from LouCee's blog feature last week - so if you are Chrizette, iamb or RJMJ - please send me an email to get the info you need to claim your prizes! You have each won a $25.00 shopping spree to Lou's shop! Oh my gosh! From robots to super heros to monsters and dinosaurs (oh my!! ), there are so many great "kids" kits in your store! I love how quirky and fun they all are! I can't wait to take my son to the Renaissance Faire so that I can use the Sir Zachary Photobook!! Congratulations, Amanda, on being chosen this week! I have always loved the animals in your Funky Farm kit. :) I love your Outdoor Artist Kit too! Thanks for the amazing giveaway! I LOVE everything A-manda Creation. I think the things I really want the most right now is the super hero series of kits. Having little girls I didn't think I'd need them but we've been to a ton of super hero birthday parties lately! I adore your Main Squeeze kit! It is too sweet! I love your scrapping style and color combinations! Can always find something to spend my money on! Awesome, awesome giveaway! That's so generous of you to give away 100 dollars and 3 kits! Fun, fun, fun for all the kiddie pages! I love all your kits, but must have your borders. Thank you for the great sale and opportunity to win. Very generous of you! I'm looking at your shop and love how colourful everything is!I love main squeeze...it would be perfect for next years Disney trip, I purchased Christmas Spirits last week and love Night at the Movies. Also the super kid certificates are a cute idea! Wow Amanda, so exciting to get to hear more about a designer I got to meet in real life! I would love to have Glad You're My Dad and Outdoor Artist. Thanks for the chance! Congrats on being the showcase. I love your kits. You have everything any would ever need for their scrapping needs. Such a lovely variety. Thank you for providing us layout and card makers with such amazing things. I love your Backyard BBQ kit... and your Smores kit is SO CUTE! So hard to choose cause all of your kits are so adorable! But, I would have to pick.. "Love you to Pieces" and "Gone Golfing" kits. Thank you so much for the chance! Congrats on being the Designer of the Week. I love your designs. I have a few of them and have used them in some of my layouts. I recently made an album for a 1 year old and used your Circus Birthday QP for the last page. Congratulations, Amanda! I love your designs. I have used Puddle Jumping more than any other kit I own...but Backyard Play Day is climbing the favorite chart as well. You have such GREAT kits! I love using Unfrogettable! Thanks! CONGRATS!!! You're an awesome designer & I love your kits. Thanks for your generosity!!! Wow -- so many choices! Congratulations for the week. I just love Woodland Winter; I think I could use that with some of our geocaching photos. What I especially like, though, is that you have so many quick pages, photo books, and such. As a real newbie, it helps to have some inspiration about how to use a kit to its fullest. Besides the fact that we have the same name - a love for the piano and singing (although I do the last two quite poorly) - your creations are beautiful! I'd have to say that my very favorite is every bit and piece of "Baked With Love"! Thanks for the opportunity! I'm a huuuuge fan! love all her kits and have almost all of them! she's a fantastic designer! thanks so much for the chance to win! I love you kits they are all full of life and color... "A day at the beach ""Back yard BBQ" and now with your new kit called "Gimme Smore"
I love the idea there is chocolate in this one though....but truly you out do yourself. Amanda you make amazing kits there really is no other way to say it. You also make all of us look like pros and you know what we love that too.. I LOVE these cute kits! My favorite is the Outdoor Artist kit! Thank you for the giveaway! Congratulations on being Designer of the Week Amanda! That's super! I love all your designs, but right now I'm digging Outdoor Artist! Love the colors! Thank you so much for the chance to win your designs! You Rock!!! I'm a sucker for your frogs! Puddle Jumping and Unfrogettable are definitely on my list! I love your Monster Scientist kit! I used it for my siggy at STS. You have many other fun kits I'd also love to own. OMG I love your new kit! We just took our son camping for the first time and this would be perfect. I have a bunch of your stuff and love what you do!! I ♥ A-manda Creations! Just take a peek at my downloads! LOL Crossing fingers that I win! :) Can't have enough goodies! All of your kits are just so super cute! The Aloha Santa really caught my eye when it came out...great kit...I like it and I don't even have a tropical christmas! Aliens and Underwear is another favorite, Backyard BBQ, Cinco De Mayo, Gimme Smore (I have Birthday Circus which I love too)...I realy could go on and on. Would be so excited to win! Your kits are amazing. I really like the Backyard BBQ, thanks for the opportunity. I love your kits with the bright, vivid colors and the many, many imaginative elements and papers. I use them so often because they make my day bright and cheerful. Thank you for that. Love so many of your kits - great values, too! The S'Mores kit is so cute - we are going camping and plan to make S'Mores so this would be perfect! Congratulations on being chosen Feature Designer. I absolutely love your new kit Gimme Smore! Thanks for the chance to win your very generous giveaway. What's not to love about your kits? They are unique, colorful and lots of fun. Your ideas are fresh and new. I must say that your new banan split kit is too cute! Thank you for the chance! It's so hard for me to name a favorite. I love your new Superhero Series. I have several of your kits; I'm not sure what zI use the most. & This Very Generous Prize That You Are Giving Away & A Chance To Win! I LOVE your kits and have many already (about 10 I think it is), but there are still many more that I want, for example; glad you're my dad and gingerbread lane which both looks like really great kits in lovely colours! Your designs and kits are so wonderful. One that I don't have is Woodland Winter. Thanks for the chance to win. I love your kits because I can find everything I need to do a beautiful layout. You have such a variety of kits too, which makes it fun!!! So many to choose from. I absolutely love your Woodland Winter kit and of course all of the camping related ones. xoxox Your'e Awesome! Thanks for the giveaway! So many cute ones, too hard to pick a favorite. Love, love turkey time, movie night and twitterpated! Bee My Honey is great and I love the Smores kit! Too cute! Can I just say I LOVE them all?!!! You have a great collection! I have stars and strips and use it often with our military affiliation. I really like the backyard BBQ kit as well. Thank you for all the cute kits you offer! Just bought the backyard BBQ kit and have used it for a few pages. Gimme Smore looks great! That's exactly what my only grandson says about Vegemite!!! At 3 he's a fairly (no make that REALLY) picky eater but loves Vegemite straight off a spoon and always wants 'smore'. Love all your monster/alien type kits as I struggle for boy type things. Also love your Day at the Beach too. Great to see you as our Featured Designer this week. I really like the fact that you are such an active designer. There are things that you sell the I just LOVE and others that I pass by but I always know that you will have something new coming out or a sale going on. These are things that I don't just like but really appreciate. So many to choose from! Aliens and underwear is awesome! My favorite is the Nutcracker Kit. Beautiful work on so many of them!! I love bee my honey. I love anything red, white & blue so "Stars & Stripes" for me I also love your new little "Gimme Smore" kit. Congrats on being designer of the week! I really like her new - Gimme Smore kit - so I would love to win it!! Thanks for the chance!! Wow! Amanda, all of your kits are just super cute!! I love that your kits are perfect for all of my everyday stuff that goes on. From camping, Holidays, beach days.....you name it. You have a kit I can use!! Thanks for your giveaway!! Super exciting and fingers crossed!! I love Gimme Smore! The colors are delicious...I love those shades of blue with the brown. That campfire is great. Naming one kit is kinda like asking which is you favorite child, so I will go with Glad You're My Dad. Thank you for your generosity. I see many fun collections, but Stars & Stripes is my fav. Wow, such awesome kits! I'd take one of each, if I could! Your designs a so fun, colorful, creative, and unique! The Gimme Smore kit is just too cute!! We just got our 1st fire pit this year, and I have lots of pics to scrap with us making yummy smores in the backyard!! I LOVE the Gimme S'more kit...so cute!!!!!! There are so many other cute kits do..love your store :) Thanks for the chance to win!!! 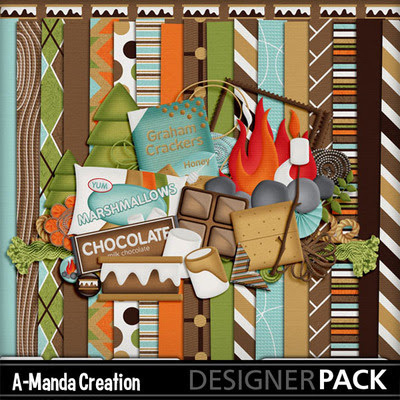 I love the look of all your kits - this Gimme S'more is making me hungry! Love the look of Outdoor Artist, too. Thanks for the chance to win! I find scrapping so easy with the combinations of borders, clusters, kits and photobooks. Play Day is my current favorite! Thanks for the chance to win the drawing! I already have so many Amanda Creation Kits, one of my favorite designers to be sure. I'm loving the new kits ... I think my fav it Banana Split. I Love Your Kits, They Are Awesome, You Always Seem To Have What I'm Looking for. & Your Elements In Your Kits Are Awesome As Well You Are On Talented Lady. I love your Outdoor Artist kit. We did chalk art this summer and this kit will be perfect for when I scrap those pictures. My favorite memory from school is the day my oldest daughter graduated. I homeschooled her from K-12th and it was a grand day for the whole family, but especially for me. She gave me a cross necklace and it came with a poem. It is a treasure and the day was a a day to remember.